How to make a draught excluder? How to make a door draught excluder? 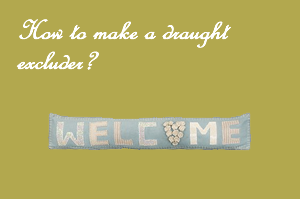 The following instructions will help you make a draught excluder with an inner lining. You can buy cheap cotton filling for your homemade draught excluder or you can use a more luxurious filling such as feathers but we are simply going to recycle our old pieces of fabric for this draught excluder. This is a great cost effective alternative to give some weight to your draught excluder and to free up some space in your wardrobe! Measure the width of the door that the draught excluder will block draughts coming through. For the inner lining: the length should be the same width as the door + (2cm for the hems) x 34cm (this includes 2cm for the hems). For the outer lining: add 1cm to the above dimensions. Matching sewing thread with a sewing kit and a sewing machine. Place your piece of lining fabric flat on the table with the length of the fabric perpendicular to you – fold the fabric in halfway through and press lightly. Pin and stitch down. When you reach a corner, keep the needle down and lift the presser foot. Turn the fabric and continue along the next edge. Trim the allowance, to within 2mm of the stitch line. Don’t forget to keep one of the side wide open to put your filling through. Turn side out and gently ease the corners into shape with a blunt pencil or something similar. If you recycle your old clothes, roll them together in a shape of your draught excluder and insert your filling. The inner lining should feel quite tight. Fasten the side: fold in the top of the material (1cm) and stitch it together with your sewing machine or by hand if preferred. With the outer fabric, repeat step 1 but we are going to insert a zip into the seam. Press back a 2cm turning along each edge, then tack the 2 folds loosely together. Tack the closed zip securely to the wrong side , so that the teeth lie exactly along the join. Fit a zip foot and sew the zip in place 6mm from the outside edge of the teeth. Stitch 3 times across the top and bottom edges at right angles. Unpick the taking. Turn side out and gently ease the corners out. Insert the inner lining and close the zip!